The City of Flagstaff, Friends of the Rio, and the Southside community Association will co-host a meeting Addressing Impacts, Challenges and Opportunities Surrounding Flooding for Southside property owners and residents. Discussion will include how stormwater/flooding has influenced and currently influences lifestyles and property in the Southside and how to manage the Rio de Flag in the future. This meeting will be Saturday, August 18th 10am to 1pm at the Murdoch Community Center(203 E Brannen Ave). Lunch will be provided. 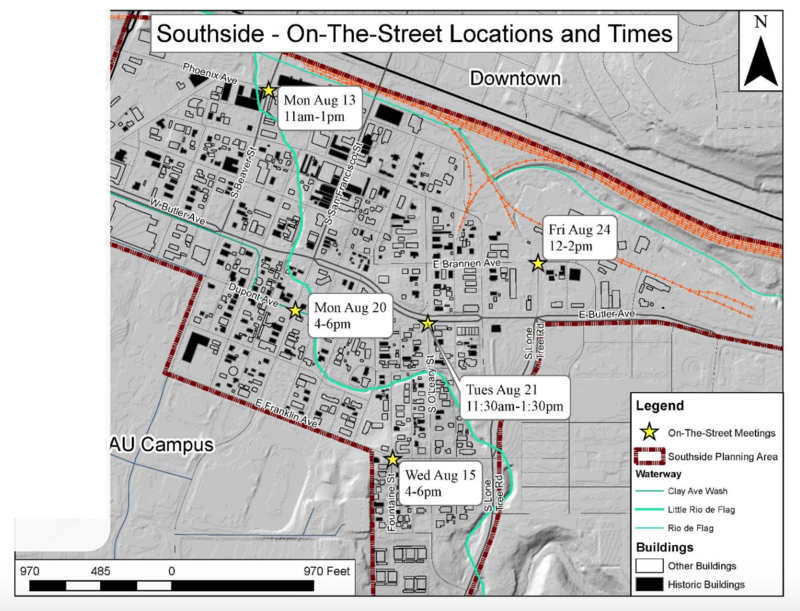 Locations, dates, and times of on-the-street meetings in the Southside Neighborhood. Additionally, the Southside community planning team will host street and block level meetings in public spaces with residents, property owners and interested stakeholders to talk about issues related to these locations. City staff will set-up a table and a pop-out canopy at the times and locations shown to the side. Staff will bring multiple maps, drawings, and tools to help facilitate conversations about what you want to see in these areas. Discussions can center around whatever topic you believe is most important. They will be organized around providing ideas for potential solutions though drawing and showing. Come ready to share your ideas on “what this street should look like,” how could this crossing work better,” “where could more bike lanes exist,” where should better public spaces/parks exist,” “how can this area feel more safe,” or whatever else you would like to design.